If you’re looking for modular house plans, you can find our database of hundreds of modular homes by clicking here. If you want to want to know what goes in to a successful floor plan for a prefab home, read on. While just about any floor plan that can be built by conventional stick built means can be built using modular construction, having a house plan that is drawn up with modular building in mind will usually allow for less expensive and more efficient construction. If you want to start designing with modular in mind, you can start with a standard home plan (of which we have hundreds in our database) and make alterations from there. The changes don’t have to be small either. We’re not just talking about moving a window here or there. It is absolutely possible – and very common – to rearrange rooms, add features, or even add entire floors to a standard home plan. A modular house plan is like a set of Legos. Sure, you can build what’s in the instructions, but you’re also free to mix and match, make changes, and create anything your heart desires. Check out our article on The Infinite Possibility of Modular Home Design. 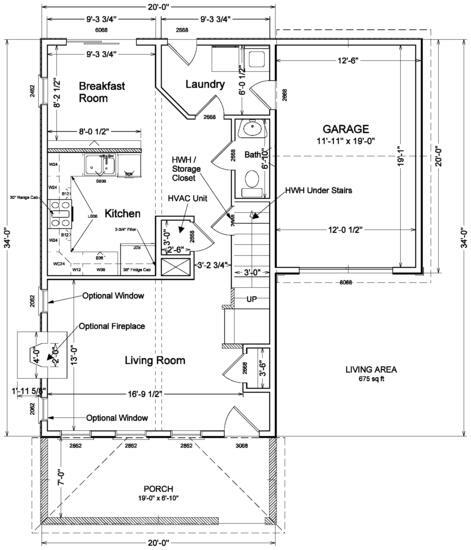 This is an example house plan of the first floor of a modular home. Note how with the exception of the living room, no room is wider than 12 feet. This is to allow the modules to be transported safely on highways. The living room is actually made up of two different modules in order to make it wider, showcasing the flexibility of modular design. Those that want to design a completely custom modular home often use architects that specialize in modular design. Again, while it is possible to convert a design that has been created by a non-modular architect, this is adding an unnecessary and expensive step. A professional that is familiar with modular building techniques will know the best ways to save time, money, and get the best features possible. Architects that specialize in Modular Design are rare, but can vastly increase the value of your home with their unique expertise. Design features like the bump out can be incorporated into modular designs more easily if the architect designs the home with modular construction in mind from the start. Depending on the design you’re working with, it may be very simple to take a stick built house plan and convert it to be more modular-friendly. Image for example that you have seen a home plan you like that has a circular bump-out in the kitchen. This is possible to achieve with modular construction of course, but it will probably be significantly less expensive to make it an octagonal or square bump-out instead. Other common changes to make would be to slightly tweak the size of rooms to make them more modular-friendly. Again, it is possible to make any size room you wish with modular construction, but sticking to more standard room sizes will dramatically lower the cost of the home and cut down on the amount of work that has to be done on site. If you already have a non-modular plan that you’re in love with, by all means, go ahead and adapt that, but if you’re still in the starting stages, your best bet is start with modular in mind from the get-go.